← Why remake Monteverdi’s Arianna? How – in what format- to remake Monteverdi’s Arianna? At the end of September 2017, OPERA OMNIA will present the premiere of Andrew Lawrence-King’s remake of Monteverdi’s lost masterpiece, Arianna (1608), performed by the young professionals and advanced students of the International Baroque Opera Project at Moscow State Theatre ‘Natalya Sats’. Read more about the project here. Singers, continuo, instrumentalists and technical theatre specialists may apply to take part, here. HOW to remake Monteverdi’s lost Arianna? The first article in this series explores “WHY remake Arianna” here. 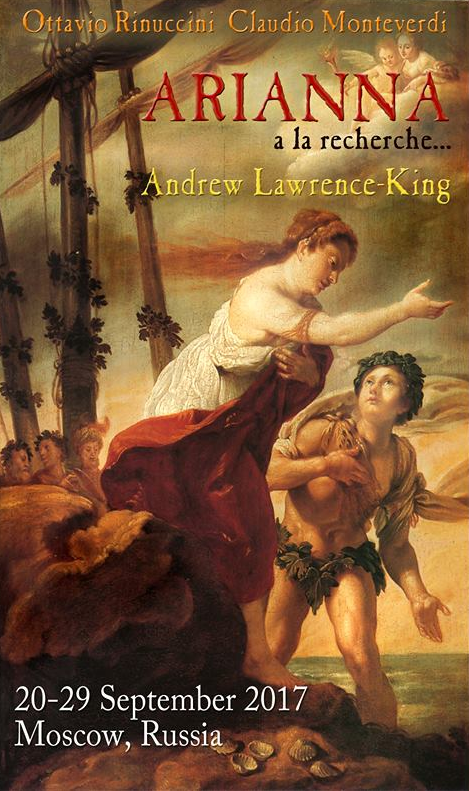 Right now, I’m in the midst of the research and creative process of writing my own remake of Monteverdi’s lost Arianna: the prologue and finale have been composed, and I’m polishing the detailed plans for the many choruses and small ensembles. There are two parts to the question of ‘how’ to remake a lost baroque opera: how should the result come out, what kind of work should it be? And how should that result be achieved, by what methodology? This post looks as the first part of the ‘how’ question: what is the remake intended to be? Inspired by the impeccable scholarship, yet fundamentally practical approach of Tim Carter’s book, Monteverdi’s Musical Theatre here, I have a clear goal in mind. I’m not trying to re-create a lost musical masterpiece: I’m writing the score for a music-drama, for a performance in a theatre, with singers and musicians, and for an audience. Just as was the case for Monteverdi in Mantua in 1608, whatever ideas I might have of an ‘ideal’ composition, I have to write for the situation at hand, for particular performers, for a particular venue, for the anticipated audience. If this project lives on, and my remade Arianna has a revival, perhaps with another cast, maybe in another venue, certainly with another audience, then there will need to be certain changes, for practical reasons. 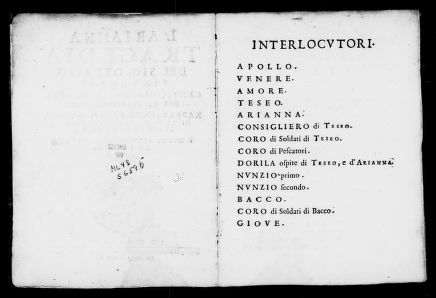 This is what we see, for example, in the two manuscript sources of Poppea, which reflect not only changes made after the premiere, but also further changes for two different productions, in two different cities, Venice and Naples. Keeping a practical outcome in mind encourages me to see the libretto not only as a text to be set to music, but also as the script for a theatrical performance, with hints of scenery, costumes, entrances and exits, of the emotional background and changing moods of the various characters. Without wanting to impose a Stanislavski-style, method-actor’s back-story on every anonymous chorus-member, there are nevertheless clear differences in character between the various soloists from the choir (I’m grateful to Tim Carter for the suggestion to investigate such differences). In Orfeo (1607), these ensemble-soloists are named as Pastori (idealised Shepherds in pastoral Arcadia); in Arianna (1608), they are members of a choir of Pescatori (similarly idealised Fishermen, who tend their nets just as the shepherds tend their sheep, and who – like the Pastori – spend their free time in love-affairs, singing and dancing). Following Professor Carter’s lead, and with his many helpful comments in private correspondence, my organisation of the various choirs – Soldiers of Teseo, Fishermen, and Soldiers of Bacchus – reflects cues and clues given by the sung texts. Considering the end result as a theatrical performance, rather than merely a musical score, also encourages thinking about gesture, one of the most important aspects of rhetorical delivery and character acting. Indeed, the anonymous c1630 Il Corago here defines acting as ‘imitating with gesture’. To act… by imitating the human, angelic or divine actions with the voice and with gestures… to perform the same action singing. Whilst there is tendency nowadays to think of gesture as a ‘bolt-on’ extra to historically informed musical performance, historical sources make it clear that Action (not only gestures of the hands, but facial expressions and movements of the whole body) was fundamental, ‘built-in’ from the outset. As he began work on a new project, Monteverdi himself searched through the libretto, looking for powerful emotions to express, and also for gestures (implied by the words) which could be imitated in instrumental music. 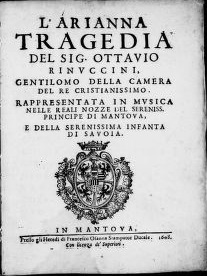 In a series of letters to Alessandro Striggio (who wrote the libretto for Orfeo) concerning an opera being planned in 1627, La finta pazza Licori (a few months later the project was abandoned), Monteverdi discusses and links the concepts of ‘imitation’ (dramatic representation, whether in acting, singing or instrumental music) and gesture. So instrumental music (played di dentro, behind the scenic backdrop, as specified in Orfeo) would imitate not only the singer’s music (the lead role was to be sung by Margherita Basile), but also her acting, specifically her gestures. Monteverdi’s instructions for the Combattimento di Tancredi e Clorinda similarly call for the actors’ passi & gesti, the instrumentalists’ varied sounds and the declamation of the text to be delivered in such a way that the three Actions (i.e. three ways of presenting drama) come together in a united representation. che le tre ationi venghino ad’incontrarsi in una imitatione unita. 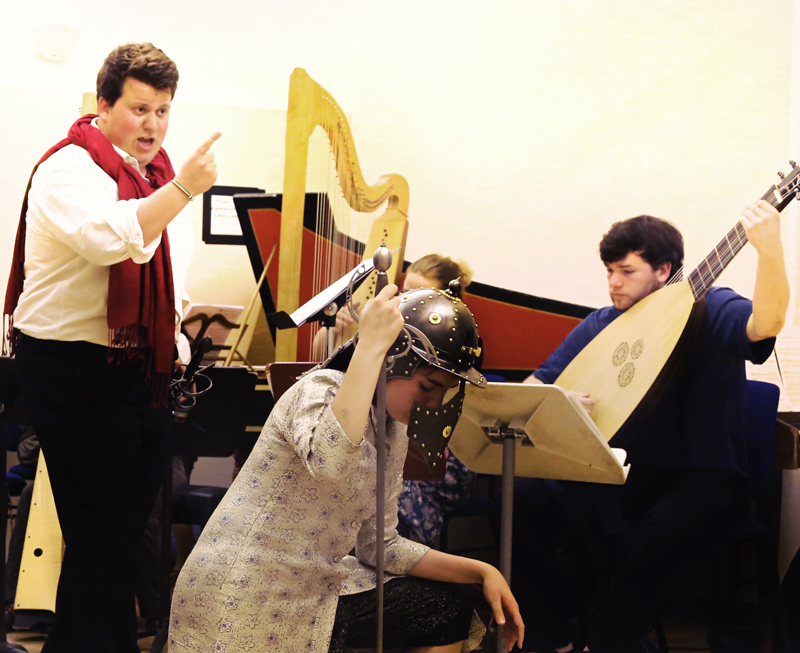 Rehearsing Combattimento in Andrew Lawrence-King’s production for the Guildhall School of Music & Drama, incorporating swordplay from Capo Ferro (1610). In both these works, Monteverdi’s aim was for his music to create effetti – not only a good effect in general, but also the ‘special effects’ of non-musical noises (e.g. the sounds of battle), and the emotional effect of ‘moving the passions’ – affetti. In this remake of Arianna, my aim is similarly to unite the essential concepts underlying Monteverdi’s vision of what we now call ‘opera’: drama as Action; acting as Gesture (of hands, face and the whole body); music and acting as Imitation; musical Effects that move the Affects (the audience’s emotions); all rooted in the communicative power (Energia) of detailed poetic imagery Enargeia. Read more about affetti/effetti, Energia/Enargeia in Caccini’s Le Nuove Musiche here. Our project is certainly not the first attempt to construct an opera around the Lamento d’Arianna. Of course, many ensembles have programmed other baroque music around the Lament, in order to create structure and flow, perhaps even a dramatic plot, within a concert performance. But in 1995, Alexander Goehr composed a modernist score for an ensemble including extensive pitched percussion, saxophone, sampler etc, but preserving some of Monteverdi’s vocal lines. A couple of excerpts are available to listen to on YouTube, the Lament here and another scene here both from the 1998 recording. In spite of the talented cast of singers, critical reviews were unfavourable. Writing for both Musical Times and Opera News, Tom Sutcliffe dismissed the project as ‘perfunctory’: ‘The opera reached its nadir in Goehr’s setting of the great surviving fragment itself [..] the harmonic implications of Goehr’s bass-line distortions destroyed the dramatic build-up’. In 2015, Claudio Cavina, director of the ensemble La Venexiana, presented a semi-staged performance of his assemblage of Monteverdi’s music, reset to the texts of Rinuccini’s Arianna libretto. Using contrafacta in this way is a thoroughly historical procedure – we have 17th-century settings of Monteverdi madrigals to devotional texts and even a contrafactum of Arianna’s Lamento with a religious text in Latin, the Pianto della Madonna. The proof of a good contrafactum is not only that the word-setting works in terms of accentuation, word-painting and changes of affetto, but also that any remembered associations connected to the original text complement the new function of the music. This requires careful consideration and adaptation of the new text and the pre-extant music. Whatever success the private performance in 2015 enjoyed was sadly eclipsed by Maestro Cavina’s subsequent illness, preventing any follow-up to the initial experiment. It is to be hoped that he will continue to make a full recovery, and perhaps even return to the challenges of Arianna. 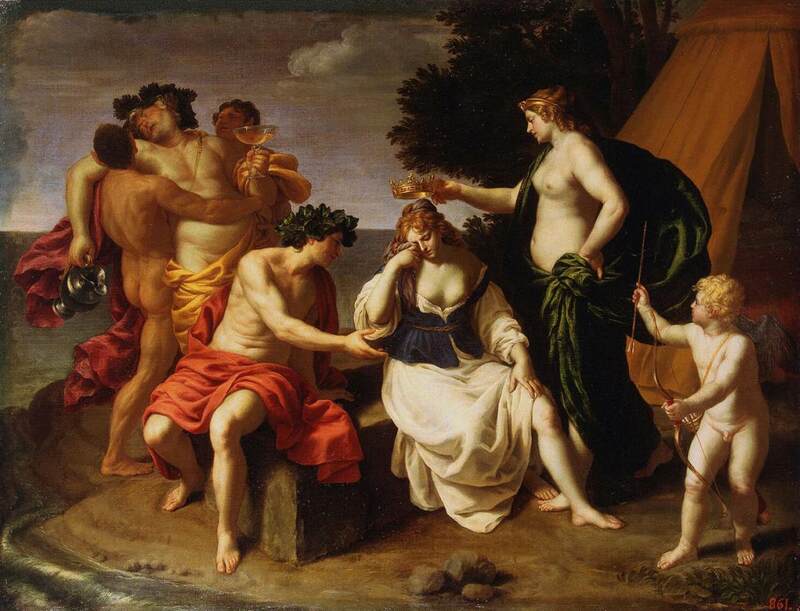 Alessandro Turchi ‘Bacchus & Ariadne’ (c1630). Historical Action is more than just Baroque Gesture! My re-make differs from both these previous projects in that the final product is intended to be a Historically Informed baroque performance (not only musically, but in the stage production too), and that it is new-composed, rather than an assemblage of contrafacta. Nevertheless my writing is carefully modelled on Monteverdi’s c1608 compositions. In a number of works of this period, a particular word or short phrase is set to precisely the same notes. A good example is Ohime!, often set falling through a ‘forbidden’ interval, c F#, syncopated against a strong bass D between the two syllables.Probably this is the musical representation of a conventional way of declaiming such words in the spoken theatre, which (as Peri tells us) is the model for seicento recitative. Where such words or short phrases occur in Rinuccini’s Arianna, I’m copying Monteverdi’s standard recipe for them. So the word mirate is set in my constructed final scene to the same rising third to which it is set in Monteverdi’s music for the Lamento. In other instances, a similar poetic image within a longer phrase, calls forth a similar (but not identical) musical setting. This encourages me to take suitable models from Monteverdi’s oeuvre as inspiration for a similar (but not identical) parallel setting. 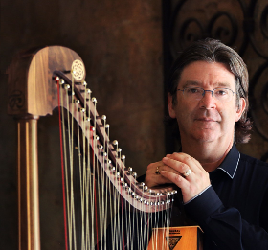 Thus my string ritornello for Apollo’s Prologue, a tenor singing tenderly to the lyre of love – su cetera d’amor teneri carmi – takes its rhythmic structure and rising phrases from the ritornello to the tenor solo from Monteverdi’s Book VII (1619) Tempro la cetra – I tune my lyre to sing the honour of Mars, god of war. But instead of the hard hexachord of G major harmonies and sharpened notes in Monteverdi’s melody, my music for Apollo’s cetra adopts the soft hexachord with G minor harmonies and melodies with Bb, Eb and F. Of course, it’s important that any associations my models evoke are appropriate: here, if the listener is reminded of another lyre being tuned, that’s all to the good, especially if the listener also appreciates the significance of the shift from warlike major to pastoral, even melancholy minor, from hard to soft hexachords in period terminology. Of course, I’m taking care to provide appropriate word-painting, whenever the poetry calls for a gesture that can be imitated in music. Apollo’s first words Io che ne l’alto… (I, who on high…) naturally require a high note on alto, matching the actor’s upward extended right hand. My next article will continue this theme of ‘How to remake Arianna’, with a detailed comparison between Monteverdi’s procedures in setting the libretto and the methodology I am evolving for this challenging (not to say, daunting) project! It was Professor Carter, playing devil’s advocate, who first challenged my Arianna project with the question, “Why?”. Since then, he has been immensely generous with comments, guidance and historical information. Inevitably, we will disagree here and there, but this project could not succeed without him. Thank you, Tim.